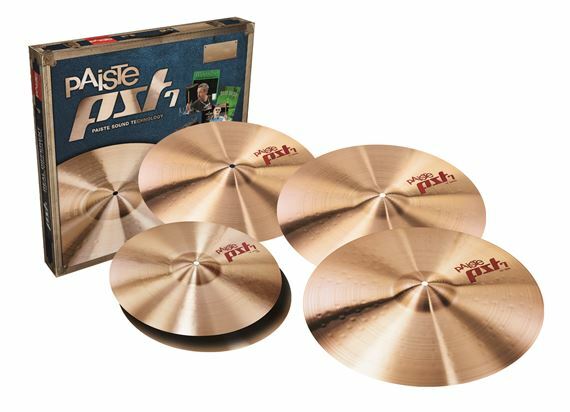 Shop Paiste PST 7 Medium Universal Cymbal Set 14/18/20 Free 16 from AMS with 0% Interest Payment Plans and Free Shipping. A great cymbal set for all volume settings for either in live playing or casual recording. This cymbal set covers an entire range of music styles. Sound character: Bright, traditional, airy, clean with warmth, clarity and tonal definition. PST7 Universal Bonus Set with Free 16"
I researched these cymbals for a few months before purchasing and I’m glad I did. These will cut through any style of music your playing and just an amazing bright sound, it’s like having the 2002 series without the price tag!!! Paiste is the only sound for me period! These are great cymbals, good sound not to high or low pitch. Great response. High hat have a clean chick, ride has clean sound and the crashes are clean sounding as well! Good investment! I love the crisp and bright tones these cymbals provide! They cut through any mix perfect. Entry level price, high quality, and high mid range group sound! Can't praise these enough!